If someone was to ask you how the F1 calendar has changed in the last 10 years or so, or alternatively ask what the financial model of F1 is these days, in both cases you'd probably come up with the same answer. 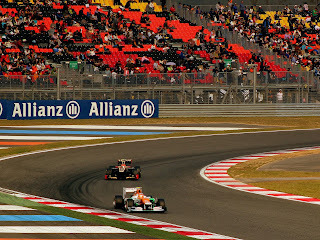 You don't need me to tell you that F1 has been chasing the Asian brass in recent times. That the itinerary has incrementally shifted eastwards to the point that today no fewer than eight of the rounds are in Asia (rewind to 1998 and there was only one), including the run of five in a row which we're currently in, tells us this. The story of the new countries joining the calendar usually goes something like this: a government decides it wants to stage a Grand Prix, and is prepared to pay a lot of money for the privilege. Yes, the event will likely make a financial loss, but you can write the loss off either as helping a national or regional branding exercise as a 'place to do business' or else against your tourism budget (or both). Got any motorsport heritage? Or a motorsport infrastructure? Or even much local interest? No? No matter. That will come later. Perhaps. Impressive new city not pictured. Yeongam races have an eerie atmosphere. But what if it goes wrong? Well, we know. Sadly the tale of the Yeongam facility in Korea that F1 gathers in this weekend is a slow motion demonstration of it. 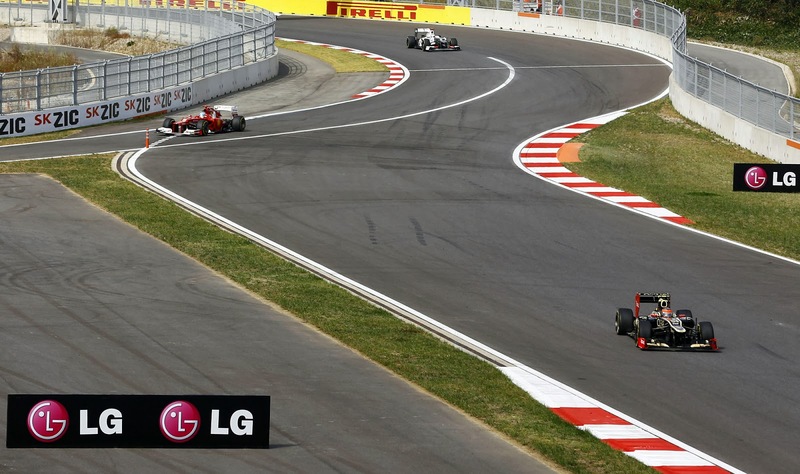 Korea and F1's road to hell was paved with good intentions, and no little ambition, at least in its days of inception. The talk then was of a street circuit in reverse, with the circuit built and then to be surrounded by a new city complete with a new marina wherein the beautiful people could pose on their boats, as well as the whole range of leisure facilities, hotels etc etc. A Monaco for the new generation if you will. Or perhaps a new Singapore, as a night race was talked about too. It sounded impressive whatever was the case, and presumably that it was in a remote location - some 400km from Seoul on reclaimed swampland near a shipping port - would stop to matter once everything was in place. 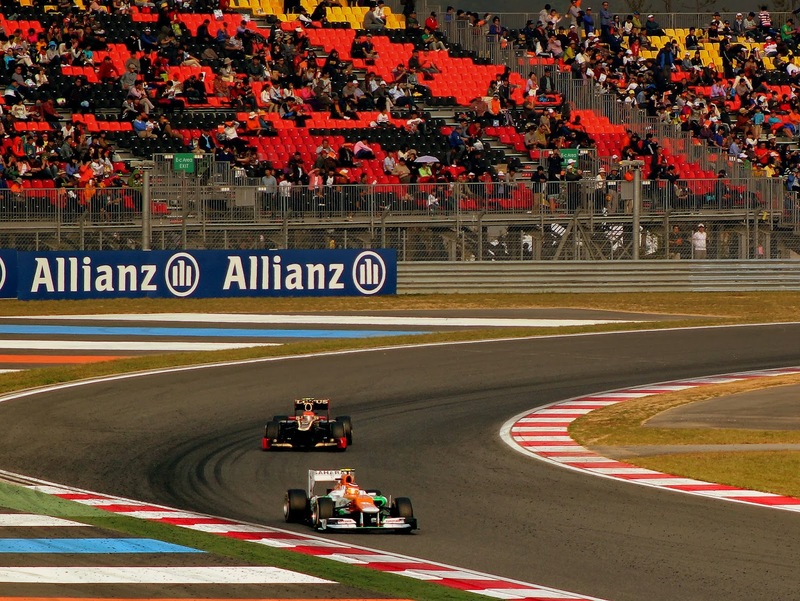 Before the first F1 visit, in 2010, construction fell behind schedule and the event looked under threat. As it was, the recently-laid track was approved a matter of days before first practice and everything was alright on the night, although the facility was skeletal at this stage and everything had a 'last minute rush to achieve the bare minimum you could get away with' quality. And worse, rather than reflecting mere teething problems it was a portent of things to come. No sooner had their Grand Prix bow happened as noises started to emanate from Korea that the money accumulated had come up short of what was required for their grand plans, as well as that they weren't happy with the losses they were making from the event (though quite how this point eluded them when they signed the deal in the first place is anyone's guess) and wanted to re-negotiate their multi-year deal or pull out altogether. Unfortunately, Bernie - to borrow from CJ on Reggie Perrin - didn't get where he is today by giving away money. It's said that a lowering of the fee did indeed take place, but beyond that the event lingers on grudgingly, and to no one's great enthusiasm - other than Bernie's when he looks at the bottom line. The Yeongam grandstands rarely are packed. And everyone turned up to Yeongam a year later to find that there had been no progress on the new gleaming city. Indeed, literally it seemed, the place had been locked up when the previous year's Grand Prix circus had left town and not opened again until the next year's had come along. Things are roughly the same now. As a result, the atmosphere at Yeongam race meetings certainly is unique, but not in a good way. The incomplete and neglected facility, in the beginnings of being crept upon by nature, complete with a desolate backdrop, ensures a rather eerie, other-worldly feel. With its unnatural quiet, brief flashes of modernity and unmistakable sense of waste and decay, it's a little reminiscent of an abandoned city from a dystopian future, perhaps out of the imagination of a Marvel Comics illustrator. And when the cutting edge F1 cars are circulating in the threadbare surroundings with a suitably sparse crowd watching on, the atmosphere starts to border to the Orwellian (it even has a separate pit and paddock complex for support events, despite not having any support events). It's a stark reminder, as if we need it, that in modern times it is TV viewing and money being moved around behind the scenes that rule. Getting numbers in through the gate to spectate is far down the list of priorities. That the recently-published 2014 calendar had the Korean event marked as provisional got a few hopeful that F1 is entering its last mile when it comes to Yeongam. This weekend thus could mark the not-especially-fond farewell. And presumably the facility will then have its back turned on it by a world with little urge to recall it other than as an oddity, to slowly crumble and linger only as a monument to its own folly. It's all a pity in a sense, as the circuit itself is by no means the worst. While it hasn't yet produced a classic race, that probably can be attributed to things other than the layout. It has many of Hermann Tilke's fingerprints, such as lengthy straights book-ended by tight slow corners, and more of a variety of corners elsewhere. The lap is roughly divided into thirds, with the first part dominated by the straights, then there are a few quick turns and the lap is ended with rather busy and more technical (i.e. slow speed) changes of direction. This split makes it quite a tricky track to set up cars for, with a teams facing a conundrum over which to prioritise between straightline speed and downforce for the corners later. It's a track with a bit of everything, so it will reward cars that are good at everything. Sebastian Vettel looks hard to stop again. And good at everything usually means Red Bull. Which usually means Sebastian Vettel. And it does even more so this time as Mark Webber will add ten places to whatever starting slot he earns following his third reprimand of the year picked up in Singapore, presumably scratching one of the more likely - a relative term of course - interruptions to the Vettel demonstration run (here last year Webber every-so-briefly threatened that version by claiming pole). 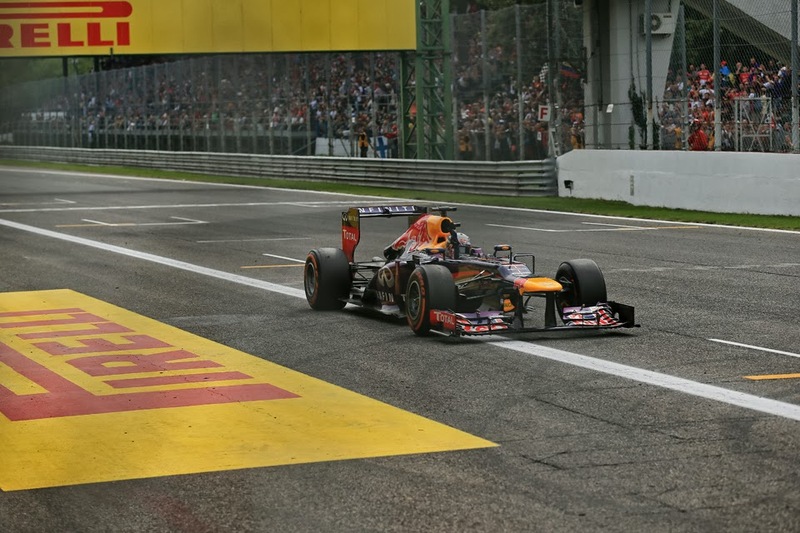 Seb, as we know, won comfortably at Spa and Monza, two tracks that were supposed to be the weakest for his RB9. Then came Singapore, and when the downforce increased his superiority over the rest did so in turn, indeed it bordered on the insulting. There seems little reason for him not to be ahead again this time too: the Korean track makes similar demands to Singapore, particularly in its final sector, and the Singapore weekend was also the scene of the last major technical upgrade of the campaign for most - and if the events of that race didn't convince any team to call off the 2013 fight then you suspect that nothing will. And, oh yeah, Vettel's won on his last two Korean visits, and would have a three-from-three full house (probably) but for a late engine failure in the other race in 2010. And he always seems to dominate this part of the campaign. The season therefore is entering an unmistakable sense of drift, with Vettel's advantage frozen. Cars haven't even set wheel on track yet, but it already seems the case that only the unusual will deprive Sebastian Vettel of victory this weekend. As for possible challengers, those with the greatest proximity to Seb could be painted silver. The Mercedes was the closest to him on pace at Singapore, and the Yeongam track characteristics should suit it. 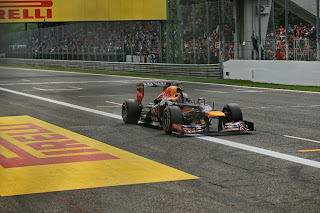 And it was at a similar track at Hungary that the haughty Vettel was last beaten, and in fine style by Lewis Hamilton. Whether it's enough to bridge the chasm of Singapore remains to be seen however. For Ferrari the chasm seems even wider, even if Fernando Alonso salvaged the best-of-the-rest-behind-Seb's-race-of-one prize in Singapore. That result owed a lot to a stunning move at turn one by Alonso to claim several places as well as an inspired team strategy selection when a mid-race safety car appeared (helped by the Ferrari's gentle touch on the tyres). Expecting the cards to fall again for the effort thus may be excepting too much, but with Alonso aboard and his indomitable fighting spirit not yet diminished few things can be ruled out entirely. 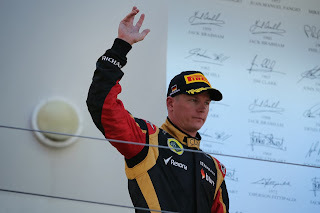 Kimi Raikkonen's back will be a source of much debate. Lotus too appeared to have the legs of Ferrari in Singapore on pace. Unreliability deprived Romain Grosjean of a good result on a weekend where he was running at the sharp end (Vettel aside, like everyone else), while Kimi Raikkonen ghosted into a podium position via a similar path to Alonso's. And the various changes of direction around the Yeongam track should suit the E21. Much attention will be on Kimi's back of course, though the surface here should aggravate it less than Singapore did. Strategy variation looks unlikely, with two-stoppers for most probable. As is Pirelli's way (understandably) right now compounds again are slightly more conservative than at the same venue last year: the supersoft and medium are the compounds available (as they were at Singapore) which compares with the supersofts and soft brought for the last Korea visit. Last time out in Singapore with the same compounds though there was close to a two second per lap difference between the two compounds, which nudged strategists towards more stops, and created headaches particularly in qualifying wherein teams struggled to cruise through the early stages using the prime tyres. At Yeongam, the track is fairly abrasive on the tyres but this has tended to be offset by rather cool temperatures; in both of the last two years the rubber has turned out to be more durable than anticipated at this venue. And the pit lane is a relatively long one. Whether this is all enough for someone to try a one-stopper remains to be seen: Pastor Maldonado tried it last year but it didn't appear outwardly to do much for him. Perhaps the most likely strategy variation though will happen via the weather, as we all can recall the heavy rain that dominated, and delayed the race start, in 2010. Furthermore the track's geographical location near the coast means that sudden showers are a relatively frequent feature. But equally there seems a risk that the competitive fight over first place this weekend will be about as tepid as the surroundings.